This product is delivered electronically at the time of purchase. 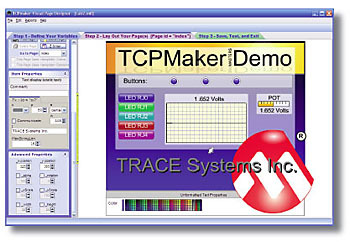 You'll be able to use TCPmaker's revolutionary drag and drop Visual Page Designer to make great looking interactive web pages, with named variables to transfer your data, and controls that you can grab onto: Beautiful 3D Pushbuttons, Sliders, Bar Gauges, Indicators, and more! 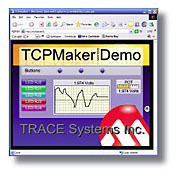 It is these controls that make TCPmaker perfect for data acquisition and control over the web. TCPmaker generates custom source code for your PIC to "wire it all together." All you need to do is fill in some simple event handlers, compile the code (with a compiler you already own), and program your device. You're on the Ethernet in minutes! You�ll be delighted at how responsive the controls are. And there's no Windows programming at all! 2-Way Direct Transfer of Variables: if you define a data item called �Pot1,� then your generated PIC code contains a variable called �Pot1�. PIC and PC are automatically kept in sync. Generates custom source code to connect your variables to controls shown in browser. Packs and unpacks data for you at both ends: always gets it right!